You can read the whole article on the GLAAD Blog: Peabody Awards Honor Groundbreaking Degrassi Episodes. Hinging on the article though, I’ll take it as an opportunity to tell you about a groundbreaking occurrence in TV history. If you’re like me, you own a TV only to stream Netflix from it, and don’t actually watch anything on Cable, or live in another continent, you might be out of the loop in terms of what Degrassi is, or why it’s important. Degrassi can be summed up as a long running soap-opera style TV show that has undergone a major revival in the TV teen scene. It’s important because it has boldly gone where most teen shows dare not go – exposing controversial topics that deserve and need to be talked about. Among other subjects, it has extensively covered gay relationships, and now, transgender issues are getting their due. Adam, an FTM transgender teen, is (to my knowledge) the first transgender character to be treated with such openness on (inter)national television, not to mention on a show aimed at teens and preteens. There is an entire episode arc dedicated solely to Adam’s struggle with being transgender, and how he, his family, and his friends, are dealing with it. 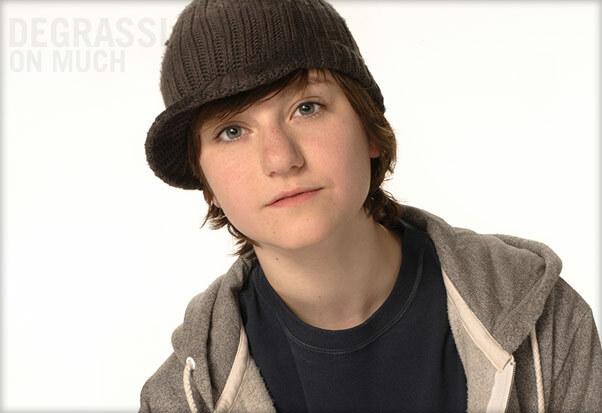 Most importantly, the show does not skirt around the issue in any way; once Adam comes out as being transgender, this continues to be one of the many revolving elements in the Degrassi world. I’ll refrain from actually reviewing the show, but I will say that if you do some creative googling, you’ll easily find the episodes online. However, I will emphasize my extreme elation at seeing a main transgender character being introduced in one of the most popular shows among teens in the US and Canada (where the show originates). This is definitely a major step towards increasing awareness, education, and visibility of transgender issues. Yes, Degrassi looks to be one of those shows that I would have LOVED as a teen, and would have even loved more had there ever been a trans character – heck even a queer character in any show would’ve done it for me back then. You should definitely check out the new episodes! An aside: could you possibly enable post and commment RSS feeds? I’d love to make it easier to see when you’ve posted something new. Thanks! I just made my way through half of season 10 just so I could see this for myself, and I have to say they’ve done a great job so far with Adam’s character. Thanks for the info, I would never have known this existed if you hadn’t mentioned it. Glad you’re newly addicted Meike! I myself need to catch up on the story. I wonder if there are other teen shows that would compare to Degrassi as informative, poignant, and bold – does anyone know of any others? May be Skins (UK version)? However they don’t have a FTM character, nor do I think they’ll include one anytime soon. And it’s definetely not as informative, but what it lacks in information, makes up in boldness I think. And I loved Naomi and Emily. Skins (UK or US?) had a genderqueer character called Franky, who unfortunately was turned into a girl in the next season. There are quite a lot of new storylines of gay and lesbian characters in teen television, but Degrassi is the first and only transgender storyline, and Franky might have been the only genderqueer one. Glad you’re newly addicted Meike! I melysf need to catch up on the story. (Ariel, thanks for pointing it out I put in the RSS links)I wonder if there are other teen shows that would compare to Degrassi as informative, poignant, and bold does anyone know of any others? I’m also glad to see that they’re going with FTM. It seems like everyone knows about MTF these days but nobody seems to think that the other way is possible. Of course, now that I live in San Francisco I know way more FTMs and FTNs than MTFs and MTNs. It’s kind of funny that in a lot of ways, it feels like because those positions are more marginalized and unknown it’s also a lot easier for them to be expressed because they’re also not as STIGMATIZED. Also, it still seems like a (genetic) woman shopping in the mens’ section at a clothing store is okay (“they must be buying something for their boyfriend” or “they’re a tomboy”) than the other way around (“they must be a transvestite/pervert, eww gross”). Clearly, there are differences between the stigmatization of FTM and MTF, but let’s put that aside and only focus on the amount of media portrayal each gets. Could it be that, because MTFs are more stigmatized, it’s more “shock-value” (in movie speak == money) and therefore get more screen time? Whereas, seeing a girl dressed in pants and short hair carries much less “shock value.” Also, MTF could seen more as, “a man would never dress as a woman unless they really really felt like they had to, so it must be real,” and thus a more convincing story. But an FTM is just a tomboy at best, dyke at worst, and it’s harder to convince an audience they are indeed transgender and as real as their counterparts. Anyway, these are just curious speculations, I would be interested in reading an informed analysis of this trend.